A pair of Indians go for a block during a past game. Two straight setbacks in the postseason brought an end to their season, but it only ignited a fire in a program that has now earned respect up and down the state. Barnes enters his fourth season at the helm of the Indians’ squad with an overall mark of 28-19. The program has gotten markedly better with each season since he took over. Returning for the Green-and-Gold is “Super Sophomore” Rachel Ehlers as an outside hitter. Also back are a trio of juniors who will be counted on heavily to provide leadership to a team that has no seniors on its roster. Jessica Amezcua will be back at the libero spot — a player that specializes in defensive skills. 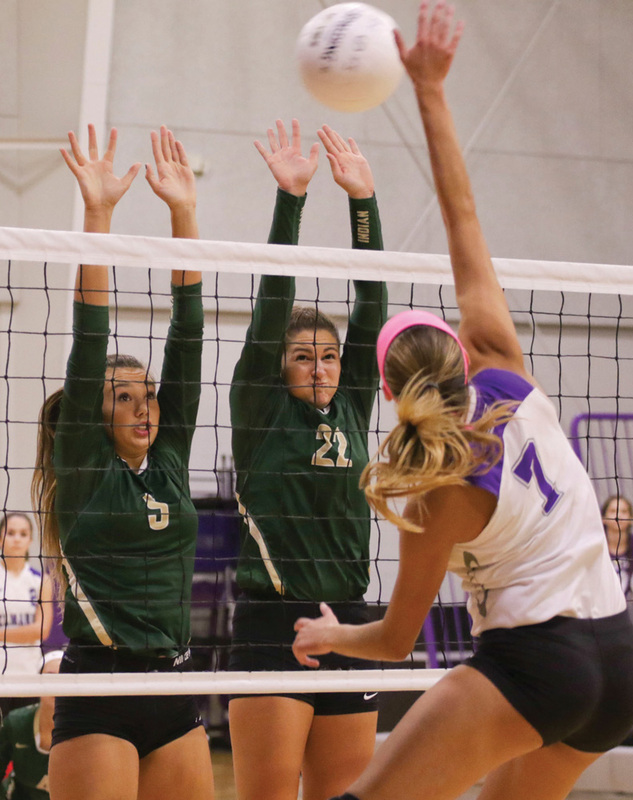 Siera Johnson is another outside hitter for the Indians, while Natalie Burnshaw mans up the middle. Newcomer junior Marianni Chavez will be joining the team as a setter. The Indians will open the season with a home date against Maryland’s Worcester Preparatory School on Friday, Sept. 7, at 4:30 p.m. They will have a five-match home stretch against Cape Henlopen (Sept. 18), Seaford (Sept. 20), Polytech (Sept. 25), Lake Forest (Sept. 27) and Delaware Military Academy (Sept. 29). They also have home dates with Woodbridge (Oct. 18) and Sussex Tech (Oct. 25). Barnes will be assisted again this year by Jay Clark.